IT’S Mornington’s dream team and the one that the Seagulls hope will take them into the upper echelons of Victoria’s elite club competition. Senior coach Adam Jamieson calls himself “a winner” and assistant Nathan Peel calls himself “a builder”. They both have strong grounds to support their claims, Jamieson having won championships with Mornington and bringing a high expectation of success to the club while Peel has earned a reputation as one of the pre-eminent teachers and developers of young players in the local game. Peel’s CV says it all having played as a professional with Preston North End, Sheffield United and Burnley and coached at youth level with Burnley. He holds a UEFA B licence. While Jamieson tries to secure promotion Peel aims to put in place a sound player development pathway that leads to the senior squad and beyond. “You have to connect the club between juniors and seniors and I don’t think that connection has been strong enough in the past,” Peel said. “We spent a lot of money last year and it didn’t work and we’ve got to focus on developing our own talent,” he said. The NPL underage leagues will be opened up next year to community clubs and already Mornington is planning to apply to enter teams. The club will field over 30 teams next season from subjunior level upwards and Jamieson was blown away by the talent on show during the grading of over 240 youngsters in the under-12 to under-16 age groups prior to Christmas. Jamieson and Michael Anderson will coach an under-12 side next season and star senior player Andre Bennett will coach at under-13 level. Just six players have been retained from last year’s senior squad but the club is nearing the end of an impressive recruiting campaign and hopes to sign two goalkeepers this week. Amir Osmancevic, Sam Catherine, Liam Baxter, Andy Mclean, Andy McIntyre, Ross Clark and Jerome Valadon have been brought to the club while Jack Heseltine, Lachlan Thomas, Charlie O’Connell and Luke LoCasto have been promoted. However Heseltine will be out of action for some time after a freak accident at senior training on Saturday morning. He suffered a triple fracture above the elbow and a dislocated shoulder and had surgery at Frankston hospital on Sunday. There also is a train-on group of five to six youngsters who will be involved with the senior squad throughout the season. “As impressive as these kids are they aren’t going to be given a game just for the sake of it but we are going to give them the opportunity to train with us and show us what they can do,” Jamieson said. Two former players have caught the eye during pre-season training and one of them, Chris McKenna, has been so impressive that Jamieson has agreed terms with the 31-year-old defender. Another to impress has been veteran striker Nick Waite who has shed 12 kilograms over the break. Peel’s presence, the quality and commitment of the recruits and a change of direction have combined to re-energise Jamieson who walked away from the game partway through last season. “I haven’t felt this good about what we are doing at this football club for the past six or seven years,” Jamieson said. Fears that Sammy Orritt would be lost to the NPL proved unfounded and the former Rotherham United and Cowdenbeath attacking midfielder has re-signed for the 2019 season. Orritt joined Mornington from NZ outfit Coastal Spirit midway through 2017. In State 2 South-East news Peninsula Strikers went down 5-0 to NPL giant Oakleigh Cannons at Centenary Park last week. The match consisted of three 30-minute periods and Oakleigh led 1-0 going into the last period of play. Key defender Michael Hoogendyk had work commitments so Oscar Marsden and Adam Crabb linked up in central defence for Strikers while Colin McCormack and Christian Morales shared goalkeeping duties. A feature of the match was a series of bizarre refereeing decision which left Strikers’ bench and most onlookers mystified. 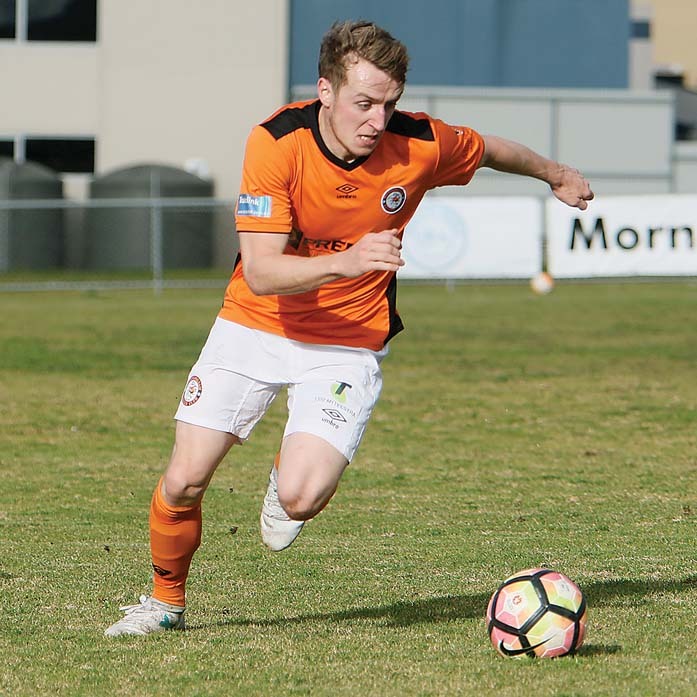 In State 3 South-East news Soccer Smart player agent Chris Anderson has been busy trying to offload players on Frankston Pines and some other local clubs but so far has received a firm no thankyou. UK-based Anderson phoned Pines president Steve Spencer last week. Pines head coach Kevin “Squizzy” Taylor has also fielded calls from player agents but he’s close to finalising his squad and remains focussed on the local market. Taylor has agreed terms with former Dandenong City and Springvale White Eagles defender Connor McAndrews who impressed against Dingley Stars. McAndrews will line up alongside Cedric Benza when Pines take on Somerville Eagles at Monterey Reserve tonight (Tuesday) at 7pm and the reserves friendly between the two clubs is at the same venue on Thursday at 7pm. Pines’ State 3 rival Skye United also is looking to add to its senior squad. “I’m looking to bring in the right type of player who will hopefully stick around the club for a few years and be a part of what I’m trying to build,” Skye head coach Phil McGuinness said. His side beat Pakenham United 4-0 in a friendly at IYU Reserve last week. Skye missed a host of one-on-one chances in the first half but took control after the interval with all four goals coming in the second period. Mitch Blake (2), Kurt Wagner-Goldsworthy and Jason Nowakowski were the scorers. In State 4 South Seaford United used a mixture of senior and reserves players in last week’s hitout against Mornington reserves at Dallas Brooks Park. Mornington won 7-3 in a contest played over four 20-minute periods. In NPLW news Aaron Myatt has resigned as under-19s coach at Southern United to take up a role as under-15 boys’ coach at Bulleen. He was appointed senior coach of Southern for the 2018 season but after an end-of-season internal review was replaced by Washington Castillo and appointed to the under-19 post. Myatt was one of Southern’s foundation coaches and although the club wished him well in his future endeavours it is understood that some Southern officials are seething over comments allegedly made by him to players and parents after training last week. While Myatt was conducting his final session Southern’s rescheduled AGM was taking place at which Shannon Palmer was re-elected unopposed as club president. The treasurer’s report highlighted the financial stability of the club after successfully dealing with a debt from a previous administration of close to $50,000, a remarkable turnaround in just 12 months. The big news in State 5 is that Football Victoria last week accepted Rosebud’s application to join the league. The club last played under the auspices of the state federation last century. It is yet to discover in which regionalised division it will compete. State 5 South club Aspendale Stingrays takes on Sandown Lions tomorrow (Wednesday) at Parkmore Soccer Club on Homeleigh Road, Keysborough. The match kicks off at 7.30pm and Aspendale was hoping that New Zealand international Luka Prelevic would be available. This weekend’s highlight is the seventh staging of the Wallace Cup at Baxter Park on Saturday with first-round matches starting at 11am. The competing teams are Baxter, Frankston Pines, Langwarrin, Moreland Zebras, Mornington, Peninsula Strikers, Seaford United and Skye United. Organ Donation Australia is supporting the event which is a fundraiser for the emergency department at Frankston Hospital and competing clubs pay a $100 team fee with spectators charged $5 entry. The draw for the groups and round-robin stage is due to be held live on Langwarrin’s facebook page on Wednesday evening (tomorrow) at 7.30pm.